2) to contribute something (especially money). As noted above, there are two different meanings with this idiom. The examples below will make the different meanings clearer. However, the comic above is referring to the first meaning (to become effective). 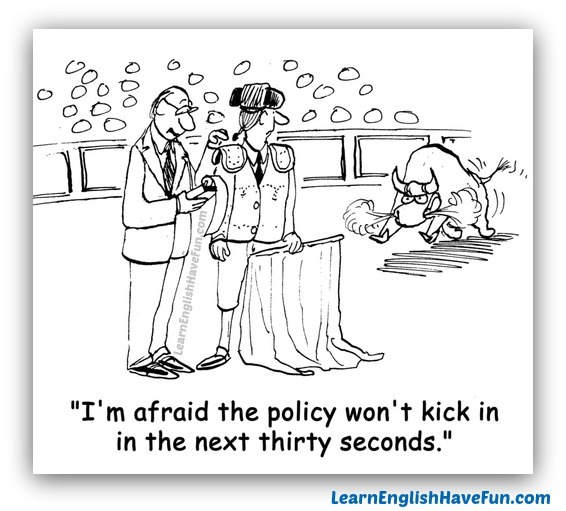 What type of insurance policy has the matador just purchased? Maybe a life insurance, disability and/or health insurance policy! Doctor, please do something! The pain killer still hasn't begun to kick in yet. The wine started to kick in after the second glass and Michelle began to relax. The excitement still hasn't kicked in that I got into Stanford University—I'm still in shock. I'll kick in $20 for the baby shower gift. What are you planning on getting? If we each just kick in $1,500 we can buy a low mileage used car and share it. I turned on the radiator twenty minutes ago but the heat just began to kick in. I'll kick in a salad for the pot luck dinner and some french bread as well. On the third try the old lawn mower's motor kicked in but it's clear the machine needs a good service. In a moment the anesthesia will start to kick in and we'll see you again when you wake up after the surgery. My boss—who makes ten times more than anyone else—always kicks in the least amount of money for our office parties and birthday celebrations. If you found this idiom useful you'll be happy to know that I am planning on continuing to add hundreds of more idioms in the months and years ahead. The best way to learn about updates to my site is to sign-up for my free newsletter. In the newsletter, I also provide helpful learning tips, a monthly audio magazine and advance notice about my writing contests. Everyone is so afraid to practice but it's really the only effective way to remember idioms and other vocabulary. Creating your own sentence and typing it out actually has a different effect on the learning processing in your brain. So be bold and write a sentence in the comments section below!